I would be grateful for some much needed advice and/or comments on my 'procedure' to make sure I have understood everything 100% - Some parts of the Goodridge instructions appear to be a bit confusing !! As I use my bike everyday I want to be sure that everything is covered before I start the work so that my bike doesn't end up being out of action. 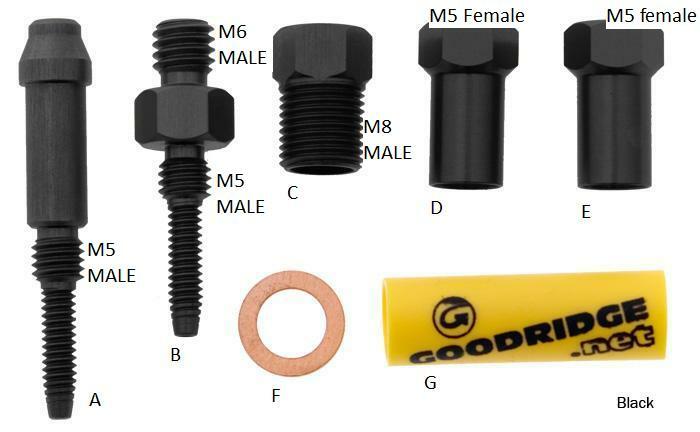 I have purchased a set of Goodridge Braided Hoses (Goodridge Hose Kit 103 Magura - Hayes HFX-9 - Clear Hose M8 Swivel-M6 Male) and will fit these to the Magura Marta SL (2009) brakes that I'm running (on Yeti 575). 2.1 Using small, fine toothed blade hack saw, cut hose to correct length (exactly the same length as plastic hose being replaced). Ensure cut edges are clean and no contamination. (cable cutters are less than sharp!!). 2.2 At end of the hose remove 11mm length of the clear plastic cover using sharp knife. 2.3 [using part A] Push small end into centre bore of [inner] plastic hose and rotate 4 turns, ensuring correct alignment of fitting into end of hose. Remove by rotating anti-clockwise. 2.4 [calliper end] Slide part E over braided hose, nut end last, and push along hose 5cm or so. To assist sliding part E onto braided hose, rotate the fitting as it is pushed on while feeding steel braid into it. 2.5 Push part B into centre bore of hose, rotating clockwise by hand until smallest thread is full engaged and covered. 2.6 Slide part E (already located on hose) up to fitting B, and engage M5 thread. Using 8mm spanner, tighten Part E onto part B until 1mm gap (between hex nuts). This clamps the hose into place. 3.1 At end of the hose remove 11mm length of the clear plastic cover using sharp knife. 3.2 [using part A] Push small end into centre bore of [inner] plastic hose and rotate 4 turns, ensuring correct alignment of fitting into end of hose. Remove by rotating anti-clockwise. 3.3 [calliper end] Slide part D over braided hose, nut end last, and push along hose 5cm or so. To assist sliding part D onto braided hose, rotate the fitting as it is pushed on while feeding steel braid into it. 3.5 Push assembled part A/C into centre bore of hose, rotating clockwise by hand until smallest thread is full engaged and covered. 3.6 Tighten M8 male thread of assembled part A/C into lever body and tighten to 4Nm. Prior to tightening, ensure hose length is not deformed or twisted. 3.7 Slide part D (already located on hose) up to fitting A/C, and engage M5 thread. Using 8mm spanner, tighten Part E onto part B until 1mm gap (between hex nuts). This clamps the hose into place. Don't use cable cutters...use a razor blade. The Magura olive fitting also works on the Goodridge hose.